There are a few things, I can't deny, I am addicted to. Vintage Pottery, Houseplants and of course Crochet. But luckily for me they all come together fabulously. 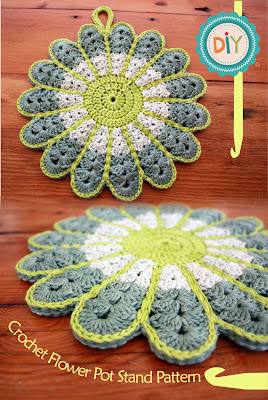 Today's free pattern I found was for a potholder/mandala that I am making for the plant that has just made it's way to our dinning table. It's not done yet, but I'm loving how bright and cheery it is.